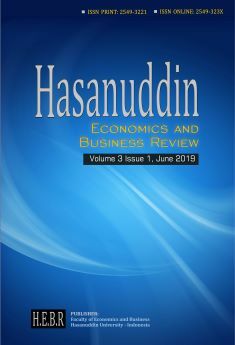 Hasanuddin Economics and Business Review (HEBR) is an international triannual open access and peer reviewed journal of economics and business. HEBR is published by Faculty of Economics and Business Hasanuddin University. The journal is published in both print and online versions. THE CHALLENGES IN HIGHER EDUCATION INSTITUTIONS IN INDONESIA: ARE WE ENTREPRENEURIAL UNIVERSITY YET?